In other Michael Fassbender news this week, A24 Films announced that it will distribute not one, but two of Michael's films: Slow West and Trespass Against Us. I've been following A24 on twitter for quite a while because of my enjoyment of Under the Skin, a film I saw at TIFF last year, and they are an interesting company that has a lot of unique films. So I'm sure they will treat these two films well. Be on the lookout for Michael's name to be associated with magazine cover stories in the coming days/week in regards to the fallout over the hacked Sony emails - which has snowballed into an even nastier political/cyber-terrorist mess. His name was front and center with other big names, like Angelina Jolie, and as I mentioned previously, Michael's visibility and brand stock can only go up from this fiasco. I think for the record, it's safe to say at this juncture, that Michael is still on board with Jobs even though he's been mum about the whole thing. *Edited to add, scan from Dec 29th edition of Star Magazine, thanks Stacie! Next week is Christmas and I'll be posting updates, and the week after that will be the annual Fassinating Year in Review. 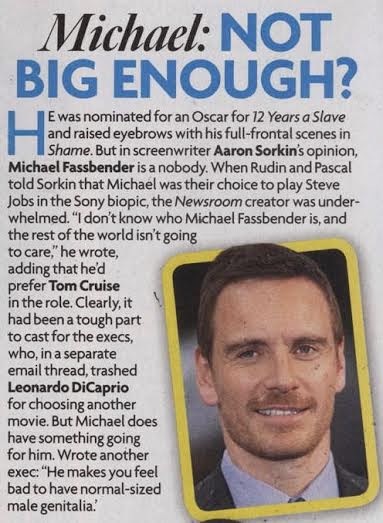 I have a scan of Michael's role in the Sony hack from this week's Star magazine. Do you want it for your blog? Sure. Please email it to me. Thanks! TGIF everyone. Yesterday Sony was on the Dutch television about the cyberattacks from Korea. I agree on you Simone that both films are in good hands by A24 films.A distributor with such a profile knows how to take care of films that are made with love. Can't wait to see them.